Hello friends of ODBD! Welcome to the July 1 release blog hop! If you got here from Sandee's blog, you are in the right place! If not, you might want to start at the ODBD Blog where you will see the entire list with links just in case any are broken along the way! Now on to my project details! I used the fabulous Hydrangea image to make this card, which is the latest in the Garden Collection. I stamped with Memento Ink and colored with Copics, then cut out the image. I drew out my vase, hand cut it and embossed with a Sizzix embossing folder. I shaded the edges a bit with Copic W-0 and then sponged with Mellow Moss. The card base is also Mellow Moss, and the dp is Kaisercraft English Rose 6 x 6 pad. The ribbon is from M's and is laced through Our Daily Bread designs Mini Tags 1 and cut with Spellbinder's Ribbon Tag Trio Three. I added a bow made on the small Bow Easy and some bling. Now I know you want to continue on the hop....so from here you should hop to the uber talented and sweetest.... Angie's Blog! Thanks for stopping and have a blessed day! Just one note... for those who asked for a tutorial on the picnic basket I made for last month's ODBD release.... check back here or on the ODBD Blog on Thurs. the 7th. I have it ready for you! Hope you'll enjoy using it for some summer picnic ideas!!! a splendid card with a wonderful mixture of shapes! Pure genius with the vase, Grace!! Beautiful!!!! LOVE the color combo! Stunning card. The colors are beautiful! Of crouse, I HEART the vase!!! Awesome all around! The colors are amazing. I absolutely LOVE the color of the bow and background. Green is one of my favorite colors. Wonderful JOB. Grace this is so beautiful! I love the pink and green color combo! And that ribbon is gorgeous!!! I love this card. The use of colors is amazing. Thank you for sharing. Lovely card, I love the colours and the vase is so pretty too. Hello Grace. I have come to your blog via the hop. So glad that I'm 'hopping' cause I found your site and love your work. I will come back often for inspiration and just to admire your projects. Happy 4th July USA blog readers. Wow - Love the colors you used, from the paper to the flower!!! So soft and lovely. That vase is a brilliant idea....absolutely wonderful card. If I wasn't feeling well and received this I know I would feel better. Blessings. Gorgeous but all of your cards are incredibly beautiful. Love the way you embossed the vase!So pretty! what gorgeous color combos. your card looks so well balanced and classicly pretty. I also love hydrangeas and your card is as beautiful as they are. Thank you for sharing. I loved all the elements that you used. Breathtaking, love your colors and that beautiful bow. Nicely done. What a stunning and amazing card Grace!! I just love the vase you created for the hydrangea and your layout and combo of papers!! Another Wow card my friend! Have a great holiday weekend!! Love the hydrangeas! These hops keep taking me to blogs that are new to me and I'm glad I found yours. I've bookmarked your home page. Love the soft colors of your project. Very nice. I would feel better if I received this beautiful card! Just lovely... Thanks for sharing with us. Your card is absolute elegance! The colors are rich yet gentle. I love the way you colored the beautiful hydrangea, the ribboned tag, the hand drawn and embossed vace, and your wonderful bow. Big Time EYE CANDY! Oh my another lovely card and I am just in awe! Thanks so much for sharing. I love the colors, and the overall card is beautiful! Grace this is so beautifully done, from the vase you created for the flowers to the big gorgeous bow! I love love love this card it just looks so elegant will have to try and make one like it. Thank you for sharing your talent. Wow Grace! I love the image, andyour coloring is spectacular! very pretty card, love the vase. Very beautiful! Love your hydrangeas and that lovely vase you created for them! Gorgeous! The vase is such a COOL addition! Love that! You are so creative! Have a blessed weekend! Such a beautiful card. The colors are so soothing. Thanks for sharing. Oh how Stunning Grace!!! I love the pink!! Gorgeous!! The details are simply gorgeous! Oh so very pretty! Love the embossed vase your created to hold the lovely flowers! Grace, this is so beautiful!!! I love the colors of your hydrangea and what a fabulous vase. You've really brought out the detail in the flowers. Great bow, too. So pretty! It almost makes me wish I was sick so I could get it! I LOVE what you did with this card, especially the colors that you used. Wow! Stunning! Love your color selections! very inventive and beautiful. Job well done. Very pretty--I like your embossed vase. Very pretty card!! Love that bow. I didn't know that bow easy now had a large size! Great to know. Grace this is so beautiful! Love the color combo. This beautiful card will have them on their feet pronto. Love the colors you chose. Hello, I love your card. I really like your creativity adding a base for the hydrangea. Looks beautiful. I love the colours and your bow is fantastic. Wow gorgeous card! I love the embossed vase and that gorgeous bow. The DP is so pretty. gorgeous card, I'd feel better! Oh! So pretty. . .love that vase you've crafted from the die cut. . .and your coloring! WOWOWOW. . .striking card! I love the English Rose DP. I really like the colors you used and especially the embossed vase. Like everyone else, I love the vase! Very beautiful and clever. Love the whole look - especially the colors! Your card Grace is apsolutely gorgeous! The hydrangea is jumping off the page and the colors are beautiful! Great job! Thank you for sharing. Very nice. This stamp is so versatile, and I love how you fashioned the vase. Your colors really make this a beautiful card. This is beautiful! Nice layering of patterned and embossed papers! The colors are gorgeous together. What a gorgeous card. Love the shades of green you used. Love how you mde your vase!! Lovely card!! Grace, this is fabulous! Love the colors you used for these flowers and love how you created this vase. This is a very good use of green which is hard to do. Beautiful! Love the added embossed vase! Another gorgeous card!! This would certainly make anyone feel much better. What wonderful texture and detail! Beautiful card! Love the colours that you have chosen for this card. And there is that gorgeous hydrangea again. Your bow is wowderful. Thank you. Great card! I love hydrangeas. This card is absolutely stunning. The colors are so restful! Amazing job. Fantastic card! Love the stamp. Grace, you card is spectacular! Love this color combination, your beautifully created vase with the lovely hydrangea and your gorgeous bow!! Beautiful!!! WOW! What a handsome card! It's picture perfect! What a beautiful card. I love that vase you created. A beautiful card Grace. I love the hydrangea in a vase that has been embossed. Gorgeous DP's and design. I love that big ribbon and the way you have the sentiment. Grace, what a gorgeous card! I love everything about it, especially the colors you choose! You do such an amazing job! The flowers are beautiful. You did a great job coloring them. Your card is beautiful! What a very elegant VASE!! Your card is stunning!! Grace What a stunning card so elegant !!! Love everything about it!! the hydrangeas are so pretty in your very creative vase! Grace, I love your card. Beautiful coloring of the new Hydrangea image. Love the layout and colors. Another "first visit" for me to your blog...I'll be back!!! W-O-W! Grace, what a beautiful card. Anyone that receives it will be blessed! I'm a craft loving grandmother, too. Oh this is so pretty. I really like your choice of papers. Utterly beautiful! Love the choice of colors, the stamped image, your hand crafted vase, and your dp's. Love your attention to detail! Gorgeous, Grace! Love the vase and the embossing is wonderful.Beautiful colors! I loved how you put the flowers in the vase. Beautiful. Your talent is amazing. The colors are beautiful and to make that vase - wow. Beautiful!!!! Love everything abouth this. The leaves look like they're made of velvet. Lovely. Such a beautiful shade of green - and, that embossed vase is absolutely gorgeous! Thank you for sharing. Grace. All I can say is I love love love your card. Love the vase you drew and the embossing folder you also used and what a cute way to use the mini tag with laceing the ribbon through it. WOW!!!! love your card and I love that vase!! the papers are gorgeous too, . just an all around beautiful card! Beautiful card - Lovely colors. Hey Grace, this is such a lovely card. I love how you did the vase! Just ingenious! my hydrangea's get prettier everyday, your card is beautiful. Stunning card , Grace ! love how you've colored the hydrangea especially ! You created a beautiful vase for your hydrangeas! Thank you for sharing it with us. Very pretty combo of colors. Love how you made the vase, it combines with the designs on the papers so well, cool effect! This is such a beautiful card. The colors are gorgeous and your talent is inpiring! Beautiful colours and use of ribbon. 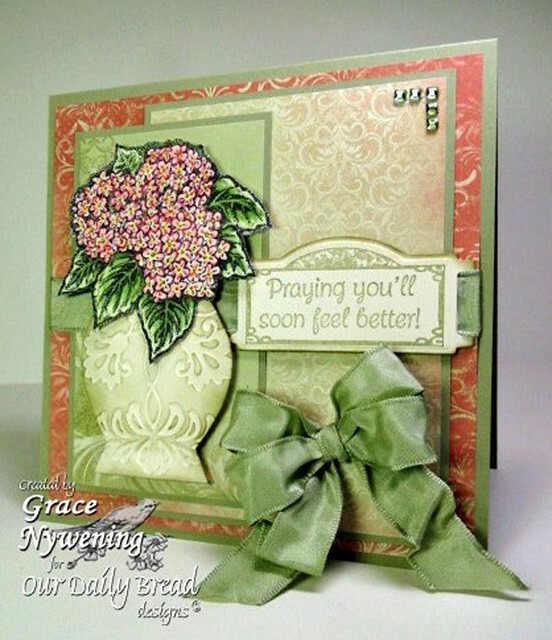 Grace what a truly lovely card, the color combinations are wonderful. Very pretty,like your color combo. Your beautiful card would certainly lift someone's spirits. the bow is wonderful and just the right touch for your special card. Wow! Love the bright, cheery colors! So pretty. Beautiful colors and textures used together. Outstanding job!!!! I love the card. I never thought of using those colors together. They do go well together. Great job. Simply beautiful! Love how it all blends together. Wonderful. Grace, what a great gift. Better than the real flowers, this will last forever! Wowza, very creative indeed! What a brilliant idea to create your own VASE!! :) Gorgeous colors and embossing. Beautiful work my friend. Love that vase! Beautiful flowers. What's there to say but STUNNING! The vase is a great detail! Beautiful card! Mary R.
You did a marvelous job on this card gf. Love the stamp and coloring so much. I love the colors and shapes on this card. Thank you for sharing. Wow! Those colors jump off the page in harmony! What an awesome piece of work you have done. God is surely using you. Such a beautiful card. Love the flowers, and detailed vase. You are so clever...designing your own vase! It looks wonderful!! I love the individual flowers. You have such a great eye for art! And, the ribbon is lovely! I love the sentiment...it is placed so beautifully! Grace, what an awesome card, and great idea to make your own vase! What's not to love about your card, Grace? The 'vase' and the tag are exceptional! So lovely. That vase is awesome. Very pretty, love how you made the vase for the hydrangea. Grace you were born an artist, amazing, love the colors you used, always something different but always beautiful. have seen. I love the vase that you put the hydrangea in. This is a unique card. What a beautiful card - hydrangeas are one of my favorite flowers. The hydrangeas were my grandmother's favorite. What a beautiful get well card. Beautiful card! Color choice is gorgeous and love that bow!!! Well my friend...at # 160 I wonder that you will even see my comment...your creation is stunning...another beauty to add to your collection...Thank you for sharing...Love it!! I love the colors in this and the gorgeous arrangement of flowers. I love that the sentiment is stamped on a ribbon slider. WOW!! What a lovely card. Grace, I always look forward to getting your e-mails. ALL your cards are so beautiful. You are very talented. beaautiful! Love it! Thanks for the inspiration. Beautiful, lovely idea to have the flowers in a vase! Gorgeous and i love the vase! !